On this date* in 1619, Italian freethinker Lucilio Vanini was adorned with a placard reading ‘Ateiste et blasphemateur du nom de Dieu’ and taken to Toulouse’s Place du Salin where he had his blasphemous tongue cut out,** then was strangled and burned at the stake. 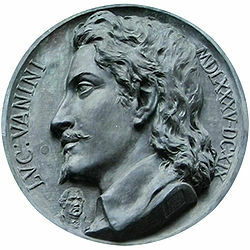 You can think of Vanini as a sort of Giordano Bruno mini-me — a bit less intellectually distinguished, a bit less famous, but doing the same peripatetic, pantheistic act before orthodoxy ran him down. Ordained a priest (like Bruno), Vanini’s 34 years were spent perambulating (like Bruno): France, Switzerland, the Low Countries, even England, where he briefly auditioned Anglicanism. Alas, (like Bruno) the libertine monk’s occult philosophy had no real home; he fled Paris for Toulouse (the place Bruno earned his doctorate), and was there charged with blasphemy. Vanini veiled his dangerous speculations in nominally pietistic cant, but he probably could have done better misdirection than a title like De Admirandis Naturae Reginae Deaeque Mortalium Arcanis (Of the Marvelous Secrets of the Queen and Goddess Nature — available in Latin from Google books). Vanini was bold enough to suggest an equivalency between human and animal souls, and reckon both mortal. Though his works purported to prove the existence of God, and he even made to his accusers a version of the “first cause” argument, they thought (probably rightly) he wasn’t being serious. They also thought (again, probably rightly) Vanini and his aristocratic patrons were debauched; Vanini’s execution kicked off a dangerous crisis for hedonists in France and elsewhere in the 1620s. There’s much more about Vanini in French here, and in English in this chapter of the public-domain The Skeptics of the Italian Renaissance. * Some sources report Feb. 19. The source of this discrepancy isn’t clear to me; the then-10-day gap between the Julian and Gregorian calendars is an obvious suspect, but as this execution took place in Catholic France, the modern Gregorian calendar had been adopted decades before. In any event, primary documentation appears to me to support the 9th.